1. Nose Secret® gives instant results. True. You can see just how easily NoseSecret® reshape your nose in seconds, right after the splints are in place. See this video for more. 2. Nose Secret® stretches the nose. False. Instead, NoseSecret® reshapes the nose to a more pleasing contour, giving the appearance of slight prominence. 4. NoseSecret® does not offer returns. False. If the NoseSecret ® kit did not meet your expectations, you can return it within the subsequent 15 days after delivery, no questions asked. 5. NoseSecret® testimonials are fake. False. NoseSecret ® testimonials are 100% genuine from real customers. Each and every review is verifiable and we use a third party independent review site which verifies that the reviews are authentic. 6. NoseSecret® ships worldwide. True. NoseSecret ships worldwide, with the exception of several countries which the delivery service doesn’t guarantee delivery confirmation. 7. Nose Secret® does not work. False. 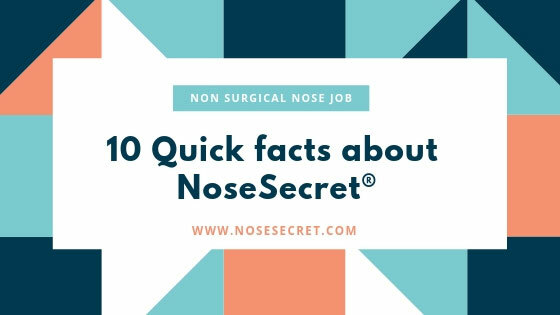 NoseSecret® is a cosmetic product that has worked for countless people. Even the media has broadly featured NoseSecret® and its benefits. 8. NoseSecret® offers permanent results. True/False. NoseSecret® is a cosmetic product and will therefore afford you with instant results. However, some people may see improvement even when the splints are not in place after wearing the product for an extended time period.